This complex is going through a "remodel", they are re-inforcing the sea wall. The work will be going on between May 28th till October 15th ish. This is why I've reduced the daily rate. The work usually starts at 8am and they leave at 3. If you are OUT and ABOUT all day, snorkeling, shopping, golf, this is a GREAT WAY TO SAVE Some $. Please note, there is work going on that affects the entire complex. Get away to a beautiful ocean front location that offers the best of both worlds. This condo is 15 feet from the ocean, Pool overlooks ocean and is 10ft away. BBQ area is less than 5ft. away from your condo, 50' Plasma HD TV, granite kitchen countertops, tumbled marble shower, tile floor, new kitchen cabinets andsome new appliances. Unit has Wi-Fi available. This Kahana Reef # 109 condominium offers an excellent location; peaceful & secluded ocean front property that is very accessible to golf, beach and water activities, dining and shopping; or just sit back and relax and enjoy your Hawaiian Vacation!!! Please check calendar for available dates!!! My family and I have been traveling back and forth to Hawaii for many years. We all work hard all year and like to be able to relax far away from our normal routine. By the way, we always go with the 5 of us, and the 5th sleeps on an air matress! We looked and looked and waited for just the perfect unit. When I first saw the unit, it was perfect. The view was exactly what I wanted. Directly in front of the ocean. It was on the ground level which makes it so convenient. The building is kept so clean with pride. So myself and my husband knew we had to have it. We all enjoy cooking our meals, so the first thing we do after landing and securing a rental car, is going on a COSTCO run and buying food and drink we will use during our weeks stay! Being steps from the bbq, It is so easy to prepare your food and then walk right back to your 'lanai'. It must be difficult if you rent on the 2nd or 3rd floors to carry the food down and then up quickly, before it gets cold. It's just like you would BBQ at your home. The pool is also very conveniently located, so you can take a dip, run to your condo fro a drink, and back on the lounge in 2 minutes! Snorkeling is the 'big' thing here. We provide 5-7 pairs goggles, snorkels, and fins, so usually, our 'vacationers' don't have to bring them. Honlu'a Bay, Black Rock and Napiili Bay are 3 of the 6 best places for snorkeling in Maui, and those 3 are each less than 10 minutes away! There is plenty for the whole family to do; since the kids are getting older they can enjoy the pool and beach while we golf and visit the local landmarks and the beautiful natural surroundings that the Islands have to offer. We usually go into La Haina a few nights to eat, Bubba Gumps and B.J. 's Pizza are great, with many other restaurants and bars available.The China Boat is across the street, and our condo is 5 minutes walking distance to Roy's, the Brew Pub, and 'OkaZuya' Miso Phat(Diners-Drive-ins and Diners!! )our favorite 'take-out' place!!! With the 'wall' separating the condo and pool from our unit, you're close to everything but far enough away if you need to be. If you want to 'lay out' and read, un-disturbed then suddenly you want a drink, you are right there, you don't have to 'trapse' upstairs! Location, Location, Location! 'Breathtaking' views, 30-40 feet from the water! This unit NOW offers Wi-Fi connectabilty, NO Waiting!!!! Brand new stove, oven, and microwave! Huge 'granite' counterspace, along with dining table and 'glass' Lanai table. 50'HD TV in the Living room, with movable wall bracket,have a Gin-N-Tonic on the lanai and swivel your head back and forth from a sports contest and breathtaking ocean view! community pool, gated, and WE are the closest unit to the pool and that is great for small children, especially when you leave the pool area! We love the Napili-Honokowai area and the Norton's property couldn't be better located. 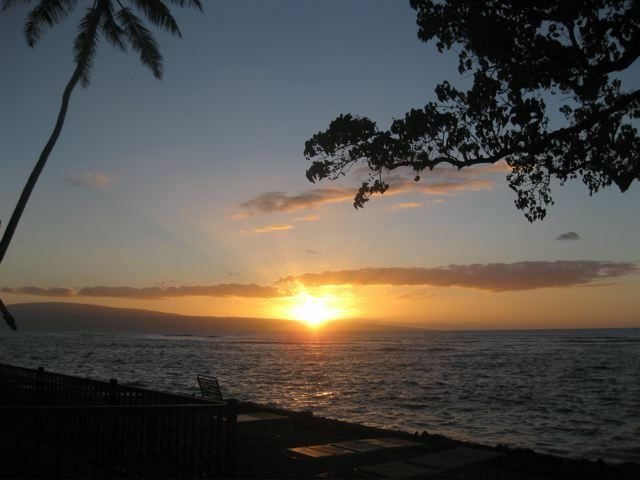 Spectacular ocean front view, walk to beaches, easy to Lahaina . . . The location is everything you want Maui to be. We came to the Kahana Reef this time because we have friends who have stayed there previously so we knew the facility. In fact, our friends joined us there this time around staying in a different unit. Unfortunately, we were terribly surprised with the condition of the unit. For the most part, everything worked, and it appears there is a brand new stove/oven, but beyond that, the unit was simply tired and worn out. Not up to the standards we expect from a VRBO property and we have stayed in 30 of them over the past 4 years. Just needs new everything: tile floors, paint, bath fixtures, lighting, furniture including patio, Just not a very appealing atmosphere. We only spent time in the condo to cook and sleep. Beyond that, the lawn area is perfect for relaxing, and the BBQ's we brand new, replaced the first day we got there. We had a wonderful 2.5 weeks on Maui as we always do, but the unit was a real disappointment. Could be great, just needs a little LOVE! The Nortons themselves were wonderfully accommodating. Convenient location with a nice new oven and comfy bed. Love Kahana Reef and have been going there for about 10 years. I think this was year 7 staying in 109. We love the location of the room and the condo which is convenient to so many places. It will be nice when they have the new sea wall completed as we lost some of the grassy area that we always use while there. There are nice beach chairs, boogie boards and snorkel gear in the closet for guest use. Look forward to returning. This property was exactly as advertised. We were looking for a quiet place to relax, and we found it. The few steps to the ocean, pool, and bbq were not only convenient but nice when you've been in the water. We enjoyed our stay and hopefully can return soon! This could be the best ocean front location in Maui; you simply walk out on your lanai and you are on the water! Great value, perfect for my husband and myself, a third person would be crowded. It is exactly as pictured, however I misunderstood and thought there was washer and dryer in unit - it's actually in the laundry but right behind the unit. We are used to tossing in our towels and wet things at night but the laundry does close at 7 pm. We may have packed differently knowing this was not in our unit but not a big deal! Great stay. It was a wonderful stay. Close to everything but private and beautiful. Every sunset amazing. You could see turtles everyday from our lani. Made friends as well with other residents. We will be back. Located 10 minutes from 3 of the 'Top 7' best places to snorkel in MAUI!